By Richard Carranza, Editor/Consultant, Lisle, IL. TEL/FAX 630.322.8995. Email: carranza@amexol.net. In common pumping applications, the centrifugal and positive displacement pumps are normally the pumps of choice. For the most part, they perform adequately; that is, assuming the flow is Newtonian, the NPSH is met, and there are neither dissolved gases nor suspended solids. However, what does one do when these conditions are not met. A good choice for pumping "unfriendly" fluids is the Disc Pump. The patented Disc Pump works mainly from one important principle: fluid flow via viscous drag. The pump does not transport fluid by making contact with an impeller of any type. Rather, it uses a set of rotating, parallel disks - called the "discpac". 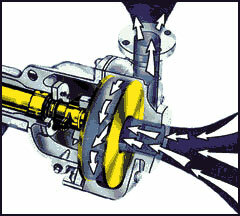 The rotating disks pull the fluid through the pump using viscous drag. Thus, since there is no impingement, viscous fluids, suspended solids, and entrained gases cannot cause damage to the pump. Figure 1 further illustrates the principle. In accordance with traditional boundary layer theory, when the fluid that comes into contact with the rotating disks, it sticks to the disks. Thus, relative to the disk, the fluid velocity is zero. But when the fluid at the disk surface is compared relative to the fluid at a distance "x" from the disk surface, the fluid at the disk surface is traveling at the maximum velocity - the velocity of the rotating disk. Figure 1. 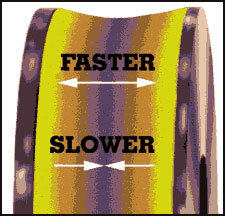 Fluid moves its fastest at the plate surface. As the fluid at the disk surface rotates, it causes the rest of the fluid to rotate too. The rest of the fluid is caused to flow due to shear stress. The shear stress generated at the disk surface is propagated through the entire fluid. There is some slip, so the fluid at the center of the discpac is flowing at the slowest speed and the fluid at the disk surface is flowing at the maximum speed. Figure 2 gives an overall view of how the fluid is introduced into the discpac and pulled through the pump via viscous drag. Figure 2. Disc Pump transports fluids using shear forces. The pump also operates under an great and vast range of operating conditions: 10000 GPM, 1000+ TDH, 1000° F, 300000 cP, and solids diameters of 10 inches. Recently, a new version of the Disc Pump has been introduce onto the market: the ANSI 2000 pump. The pump meets all the ANSI requirements and still retains the unique characteristics of the Disc Pump that make it so useful in handling "unfriendly fluids". Jeannie Smith, Discflo Corporation, El Cajon, CA, says "Discflo's ANSI 2000 meets all ANSI B73.1 standards, but it is not just another ANSI pump. Its patented design uses no impingement device, has little pump-to-fluid contact, produces laminar flow, and almost no radial loads." She continues, "At 660 cPs, the ANSI 2000 uses half the horsepower of available ANSI centrifugals. It gets more efficient as viscosity rises and handles higher levels - in excess of 40,000 cPs. Other ANSI pumps lose 50% of capacity when entrained air levels reach 6%, and fail at 7%. The ANSI 2000 handles levels many times higher, exceeding all current ANSI designs."